This pattani kurma(pattani korma) goes very well with chapathi,rice,roti,dosa and appam. Dried peas, a small but nutritionally mighty member of the legume family, are a very good source of cholesterol-lowering fiber. Not only can dried peas help lower cholesterol, they are also of special benefit in managing blood-sugar disorders since their high fiber content prevents blood sugar levels from rising rapidly after a meal. 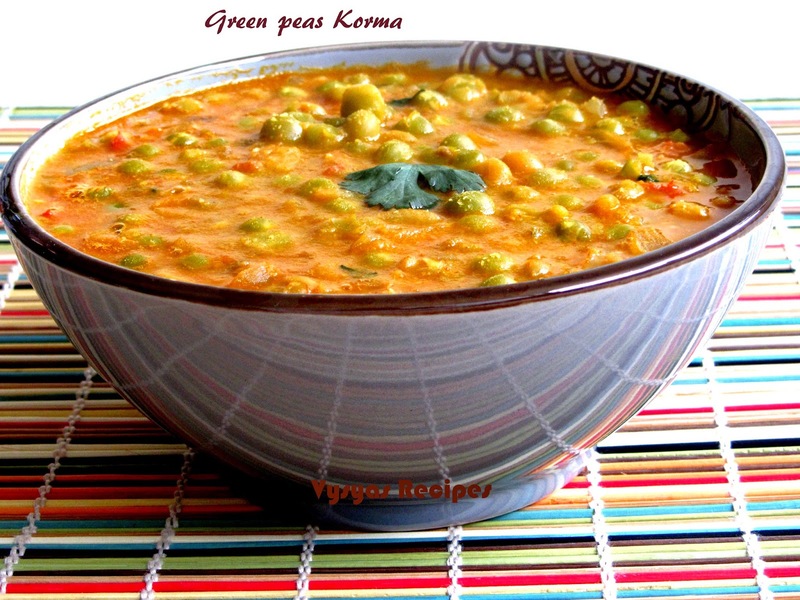 Now we prepare Green peas kurma. Dried Green peas - 1 cup. cinnamon sticks - small piece 1. Boil green peas for 8 to 10 whistles. [Boiled green peas should be soft,so that it incorporate well]. Grind coconut,fennel seeds, into a smooth paste with needed water. Heat the oil in a kadai,add cinnamon sticks, cloves, cardomom saute till gets nice smell. Add chopped onions and ginger garlic paste, saute till onions turns golden brown, then add tomatoes, chilli powder,turmeric,coriander powder, and salt.saute till tomatoes turns mushy. Add boiled green peas with needed water. stir well. When it starts boiling, add ground paste.Allow it to boil for few minutes. [10-12 min],till everything combines and comes in the form of Gravy consistency. Now spicy Pattani kurma is ready.It goes very well with chapathi,roti, rice and mild pulao's.